It’s at home we learn how to behave among other people. It’s where we first experience acceptance! 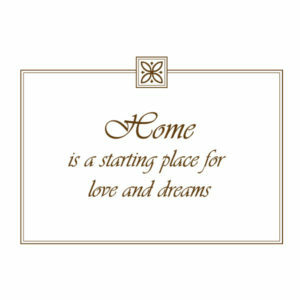 ‘Home is a starting place for love and dreams’ wall words are available from DecorativeLettering. These are wonderful words to come to at the end of a long day. They will look amazing in the family room, foyer, bedroom and even in the kitchen! Apply them on wall spaces such as between sconces, above the headboard or even above the fireplace. They will become the focal points in the room! The wall letters will be a constant reminder of all the good things you have at home! These black Vivaldi styled wall letters are also available in different colors and styles. This means that you will find something that ties in with the decor you have at home! The lettering art is a fun way of not only spicing up the wall quotes but also for influencing the mood you would like in your home: from calm to joyous! Our wall quotes do look like they were painted on! This is because they do not leave any marks around them on the application. They are also durable because they are not affected by extreme temperature changes. They are as good as new in winter as they are in summer! Do call or email: we would love to help you decorate with wall decor that makes your home extra special!